A teenage cyclist killed a 75-year-old man jogging in Central Park earlier this month. At around 4:52 p.m. on Sunday, August 3, Irving Schachter was jogging on the east park loop near 72nd Street when he was hit by a 17-year-old cyclist traveling in the direction of traffic, according to NYPD. Schachter was admitted to New York-Presbyterian/Weill Cornell Medical Center with head trauma. He died on August 5. According to a post from Schachter’s wife Hindy on the New York Cycle Club message board, the cyclist veered into the pedestrian lane on the loop. The crash is under investigation by NYPD’s Collision Investigation Squad, and no charges or summonses have been issued yet. This marks the first time a pedestrian has been killed by a cyclist in New York since 2009, when a wrong-way cyclist in Midtown struck Stuart Gruskin, who, like Schachter, died of head trauma. Schachter was a long-time member of the NYCC who led rides and was an active cyclist and runner at age 75. He was training for the 2014 New York City Marathon when he was struck. …this short message also should remind folks of the cyclist’s dual nature. Many of us see cyclists as potential victims of cars. And we are. The city still needs to do much more to secure our safety on Manhattan’s streets. To that end we should support the many Transportation Alternative campaigns. But we are also potential predators. One careless move on a bike and we can take down a runner, a walker, a child skipping along. As we want car drivers to be alert to our rights, so too we must act to protect the rights of other people. I agree with Joe R. that people need to look out for their own safety (and, I’d add, for that of children under our supervision and others who are unable to do it for themselves). However, his discussion of momentum applies only to the impact between the bicyclist or motor vehicle and pedestrian. Generalities about the severity of impact are only valid as generalities. 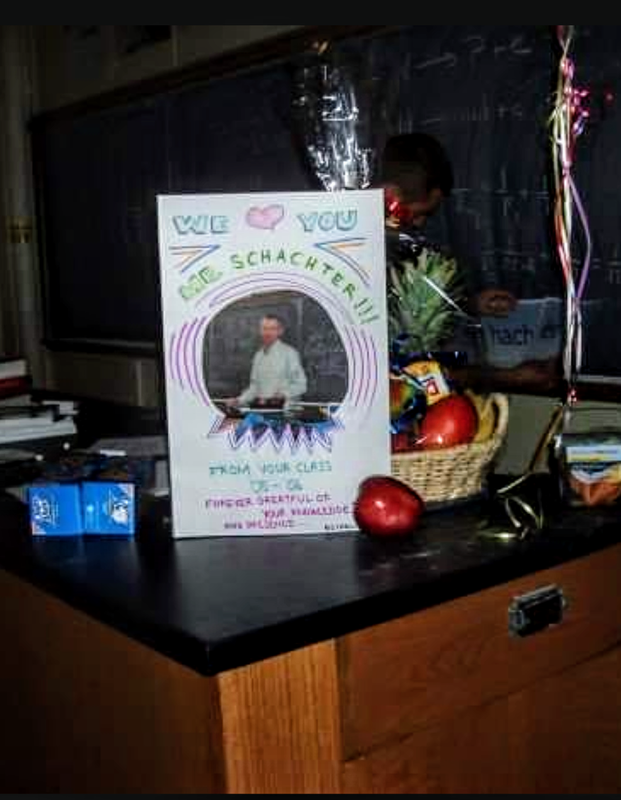 What killed Mr. Shachter was the impact of his head with the ground. There are brush-by and sideswipe collisions with light impacts, after all. — and mere slip and fall incidents, with both bicyclists and pedestrians. I am recalling when I was 19 years old, walking from lunch at college in Vermont, slipped on ice and fell backward. I was able to break the fall with my hands so I did not have a head impact. My head had landed only inches in front of a high curb. If it had landed on the curb, I would have had head trauma and could easily have died, though there was *no* impact with another person, bicyclist or motor vehicle. You going to enforce jaywalking laws too? The racists are coming out of the woodwork to bash cyclists. Awesome. Funny how the only time some people talk about how drivers should be prosecuted more is when a cyclist hits somebody. I wonder how much time you actually spend in shared multi-use spaces in NYC. The level of interference and conflict is really bad, and really dangerous. I’ve commuted by bike for much of the last 20 years. I’ve been riding recreationally for on the streets and in the parks since the early 70s. I gave up riding in Central Park for fun/exercise many years ago. It’s too dangerous and frustrating. Death may be rare, but serious injuries stemming from conflict between the different modes is a frequent occurrence; frustration and near misses are a constant. We all know the causes: bikes in the running lanes; runners in the bike lanes; cars, carriages and pedicabs where they shouldn’t be; enormous crowding overall; let’s not even talk about skaters. The answer is physical separation between the modes, all motor vehicles out of the park forever, at all times, except real emergency vehicles (Conservancy scooters don’t count! ); real traffic enforcement and direction at peak times, and during the evenings. Self-enforcement and everybody respecting each other simply does not work in CP, and it’s unrealistic to think that they can. I agree that runner encroachment on designated/separate bike space is a problem (and a puzzle in the case of the greenway — why do they run in bike lanes when there are beautiful, sparsely used running areas?). But the answer to this is not “don’t separate the modes;” The answer is “clearly publish and enforce the rules”. You didn’t “have to” pass him where there wasn’t room to do so. You could, and should have, slowed down until there was more space, and/or figured out a way to alert the slower cyclist to make room (ring your bell, say excuse me or on your left). You make points up-thread about how rules and separation aren’t necessary if we all just behave better. Yet you’re offering a a perfect illustration of why that doesn’t work. As much as I am frustrated by joggers in the bike lanes, none of this was the joggers’ fault — it was yours for doing something dangerous and unnecessary. We all do it, and unfortunately, we can’t be trusted not to enough the time to keep crashes from happening. We may pose less risk of harm than cars as a matter of physics, but we don’t behave better than cars. I did wait quite a long time to pass him and I did ring my bell. This slower cyclist was being erratic and did not respond by moving over, biking straight or facilitating passing. Eventually I had to get around him. If the joggers had been on the large, beautiful, uncrowded walkway set up for them, I would have had the space to pass the erratic cyclist with the wide berth that I knew was needed. Also, I was out there not for recreation but for transportation and didn’t have the luxury of prolonging my ride by staying behind a slow, erratic cyclist at great length. I went on a number of Five Borough Bicycle Club rides with Irv and Hindy. I never got to talk to Irv much because he was such an incredibly strong cyclist. I couldn’t keep up. In the face of her terrible loss, Hindy’s high-minded statement is remarkable and all too rare. I also want to remind readers that one benefit of eliminating regular motorized traffic from Central Park will be the ability to redesign the loop road to better distinguish and separate its legitimate recreational users. I commute by the greenway nearly every day, run into situations like this all the time and share your frustration. But I think you’re rationalizing your mistake. You decided to do something dangerous because you were in a hurry and caused injury to yourself and another person. OK, sure, if the joggers weren’t there, there would have been more room. But they WERE there, so there wasn’t more room, so passing closely someone who meandering all over the lane was a dangerous thing to do. Going slowly for longer than you wanted to was an option, but you decided not to take that option. That’s not someone else’s fault. That’s yours. I’m not saying that I’m better than you would never pass someone closer than I should out of impatience, but I don’t kid myself about other people being at fault for situations of my creation. Of course it was partly the joggers’ fault. They contributed to creating a dangerous situation. Daphna may have misjudged the space that was left under the dangerous situation created by the joggers, thus being a more proximate cause to the crash, but the ultimate fault is shared. If a vandal drops thumbtacks on the road and you swerve to avoid them but misjudge the space and crash onto someone else, is the vandal not at fault too? I think if you ask a few runners why they run in the bike lane (which I have done), the answer you’re most likely to get isn’t “well, I made a well considered decision after weighing the costs and benefits and the impacts on others.” I think the answer you’re most likely to get is closer to “f*ck you a*hole, you don’t own the park.” To me, the large number of runners in the bike lane suggests that many people value their convenience over the safety of other people, if they even imagine that other people exist at all. [As does the presence of cyclists in places they don’t belong, which, from what I understand, is what caused the incident that triggered this discussion]. I wasn’t talking about the bike lane. I did not put all the blame on the joggers who were inappropriately filling the bikeway, but rather wrote with nuance that the crash was “in part” due to the joggers and they deserved a “large portion” of the fault. I do see changes I could make in my own behavior to avoid a situation like this in the future if faced the same difficult conditions. I was a relatively new cyclist at the time that this happened. Do you have definitive information as to why the cyclist hit Irv (someone I knew, BTW)? It’s not that “cyclists are always innocent” or that the cyclist is not liable, but it’s premature to label the what the cyclist did “a senseless act of criminal negligence”. I really don’t like your comment about all being careful. Just because you only weigh a hundred pounds or so, you still have to be careful that you don’t step in front of an oncoming car. Pedestrians are not all innocent, and it is ignorance to think otherwise. While walking with a good friend who was in the middle of texting his wife, I had to physically pull him back as he stepped into a crosswalk without looking, and his foot almost brushed the oncoming car. Had there been a collision, pedestrian (one of my best friends) 100% wrong, driver 0% wrong. Obviously I am not saying that this example is represents all, most, or even many collisions involving pedestrians, but simply – EVERYONE NEEDS TO BE CAREFUL – PERIOD. Even pedestrians. I am an avid cyclist, runner, hiker, trekker, walker, stroller, sitter, and lying-down-in-the-grasser. I love the adventure and sense of accomplishment and breaking of thresholds that come with long-distance cycling and running, as well as reaching the top of a mountain. I am inured of the Laws of Physics, and of the joy of sharing this world of motion with other people. I also happen to be Irv’s son-in-law. He would have entertained all your debates about the physics of collisions, momentum, mass, acceleration, and demystified it all for you, with a broad smile. It’s a shame Irv can’t join in this conversation, though. Let’s take Hindy’s and Irv’s lead, who are here and here no longer, to promise ourselves to be better cyclists, better runners, better people, when amongst each other. I assure you that not all of us who train at speed in Central Park are careless. Irv was and I am a member of New York Cycle Club. NYCC members absolutely train at speed in Central Park early in the morning (I lead a weekday laps group starting at 6AM finishing before 7AM; other groups start even earlier). We do not use aero bars. We yield to pedestrians; we do not use the runner’s lane to go around pedi cabs or horse drawn carriages (or the manure left by the horses). Other groups such as Century Road Club Association (CRCA) behave similarly. I and others who ride in training groups occasionally notice individuals – sometimes triathletes, sometimes random idiots — who don’t obey the rules of the road. I knew Irv. Irv loved cycling, hiking and running. And physics. He was one of my cycling mentors and occasional riding buddy. Please, don’t disgrace Irv’s legacy by attacking responsible cyclists who train in Central Park because of the thoughtless actions of a callow youth.. I am a 57 year old native New Yorker and pedicab driver. I continually observe cyclists, vehicle drivers and pedicab drivers breaking laws, running lights, failing to yield to others and the list goes on. Bottom line. All involved have to show respect for each other. And those with the greatest physical prowess (18 wheel trucks) hold the greater burden of responsibility. That being said, pedestrian need to stop texting and jaywalking. …except that senior (i.e., least likely to text) are more likely to get killed than any other population and that the most prevalent way people get hit in NY is in the crosswalk with the light in their favor (i.e., not “jaywalking”). I taught Physics with Irv for 25 years. He was a terrific colleague, excellent chess player, and even biked a couple of times to my house in Freehold (once with his daughter) a mere 50 miles or so. I would of enjoyed rooting for him to complete the NYC marathon. . CK Chu last year and Irv Schacter will both be greatly missed. Condolences to Hindy and family. While walking with a good friend who was in the middle of texting his wife, I had to physically pull him back as he stepped into a crosswalk without looking, and his foot almost brushed the oncoming car. Had there been a collision, pedestrian (one of my best friends) 100% wrong, driver 0% wrong. Was he crossing the street with the light in his favor? If so, the motorist was legally obligated to yield to him. It’s certainly a good idea for pedestrians to be alert while crossing the street with the light, because so many motorists fall to yield, but that doesn’t shift the legal responsibility. cyclists are on the roads which were created to support cars. New York City streets were not created to support cars. Nice try, though. The fact is, roads were paid with tax dollars to support commerce. The bike-ability of the road is incidental to the function of the road as an instrument of interstate commerce. New York City streets are not instruments of interstate commerce. New York City streets are funded by all New York City taxpayers, without regard to whether they drive every day or not at all or anywhere in between. The driver is legally obligated to yield to him either way. The problem with lights is they make drivers forget this. In the absence of explicit traffic control devices, the driver is legally obligated to yield (as you say), but the pedestrian also has an obligation, namely to not step into the street with traffic approaching so closely that it can’t reasonably stop in time. If there’s a traffic signal (in the pedestrian’s favor) or other traffic control device, the responsibility is 100% the motorist’s. Even if the pedestrian is completely oblivious to his surroundings, the driver is required to yield. Even in the presence of explicit traffic control devices, the driver is still obligated to yield even if a pedestrian does not live up to his obligation to not cross against the device’s predetermined instructions. The driver can claim negligence on the part of the pedestrian if he reasonably couldn’t stop in time and reasonably didn’t know the pedestrian was going end up in front of him, but if it can be shown his mindset was such that he deliberately didn’t stop when he could have it’s have a homicide case of some sort. Probably manslaughter. Andres, if the cyclist who hit Mr Schachter rode his bike into the runners lane to avoid the pedicab that was slowing him down, isnt that NEGLIGENCE, and a cause for some action to find him at fault? Jail time? why not. Agreed. I deliberately focused on a case in which the motorist is undoubtedly 100% at fault. I’m not a lawyer, but that sounds like negligence, at least. OTOH, swerving to avoid a pedicab that just did something dangerous may not be. Perhaps we know more about the situation at this time, but when this crash was reported, I/we did not have enough information to judge. They should put speed pumps in the park to cause cyclists to slow down. I see them rarely stopping at red lights. I agree completely! There shouldn’t be any cars allowed in Central Park. Most New Yorkers seem to have the same complaint! We need more space! The park is no exception. Other then Yellowstone, I can’t name off too many parks that allow cars to drive through it. As an avid cyclist, I’m constantly on defense when I’m riding through Central Park. I broke my collar bone earlier this year when a tourist on a rental bike slammed on his brakes in front of me, I’ve also witnessed 3 accidents this summer from people with little to no experience operating bicycles, 2 of which involved pedestrians walking out in front of the bikes. You never know what to expect when you drop into the park for your ride! I’ve had toddlers run out in front of me, pedestrians walk out on crosswalks texting when I have the green light, tourists on rental bikes riding side by side 4 deep taking up the entire bike lane, pedestrians in the bike lane, speeding taxis in the bike lanes. We need more space! From our physics class in 2006.